You guys recently quadruped it. I want to thank you for making this point. It really helps illustrate how horribly irresponsible and utterly stupid and dishonest Trumpers are. 1)2007, 2008, and the majority of 2009 are the Bush budgets. 2) Most economists agree that running deficits during a rescission is largely unavoidable and potentially beneficial. 3) Thus, during good economic times, you are suppose to bring down the deficit and bring in money to prepare for the next down turn. As we see during Obama's term as the deficit shrink and the economy improved. 4)Trump and the GOP have managed to double the deficit during a good economic time and without a war. Talk about complete irresponsibility. This is the same dumbass who thinks the popular vote nominates the president is now telling us the president not Congress is control of passing budgets. It's obvious you need to take a basic civic class. He would have to drop his feminist pottery class. No chance. If it was purely a "GOP congress" like you dumbly want to say, then wtf just happened in the last year where this GOP Congress oversaw the federal deficit double under Trump? I never said anything about "who controls" the passing of the budget. Way to show off the famed Trumper illiteracy. I have stated the very simple fact. 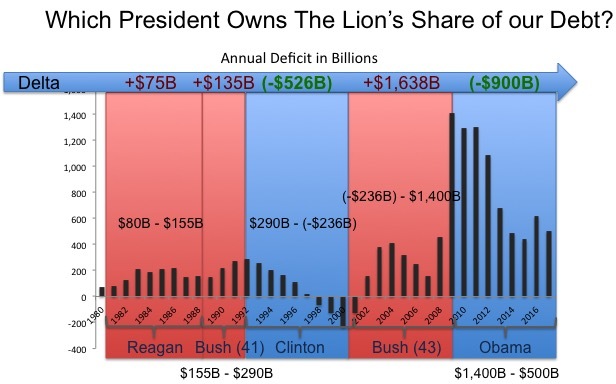 Its been only under democratic presidents that the deficit has gone down or we have run a surplus. Now keep getting triggered by facts dumbass. And here you are piggy backing off of others like the pathetic unAmerican piece of trash you are. 2009, split control: "A Bush budget!" 2010, Dem control: "Still a Bush budget!!" I never said anything about 2010 being a Bush Budget. Can you not read? And I take it you don't understand how the fiscal year works. Its okay. I've yet to meet a Trumper who does. Republicans increase the deficit, Dems reduce it. It's been like this for the past 40 years, why would it change now? Two of the most recent successful conservative political movements... the Republican Revolution in the 1990’s and the Tea Party Movement were focused on fiscal conservatism and deficit/debt reduction. Trump and his fake conservative supporters barely mention the deficit/debt. Trump will always be a New York liberal. Ok so 2010's an Obama + Dem Congress budget. I'm glad we finally got that out of you. A leftist worried about the deficit after 8 years of it skyrocketing without a single thread about it? Nope does not come across as sincere. So does that change anything about the report? The actual numbers were already posted bhrah. Dems had Congress for only 4 of the last 25 years. In that tiny windo, they blew up $5T(!!) in new debt before the voters kicked them out. Facts are troubling things sometimes. You should get on the phone with Claire McCaskill about it.